Anyone who has been to Oaxaca Mexico will tell you that it is one of their favorite destinations in Mexico. Why do people love Oaxaca? Lets start with the fact that its elevation (5085 ft. or 1550 m.) makes it a nice escape from the heat along the coast. 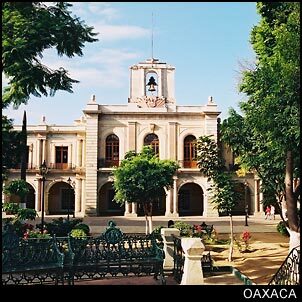 Oaxaca is a comfortable temperate climate that is not too hot in the summer and not too cool in the winter. That is where having a good time while getting out and about begins. Spanish colonial architecture with cathedrals like Santo Domingo which they began building in 1572 and took 200 years to complete. Not to mention the sidewalks cut from green volcanic rock or the beautiful zocalo surrounded by historic buildings. Then there are the festivals . . . and Oaxaca doesn't just do famous ones like the "Day of the Dead" like no other, but they seem to have an especially long list of festivals, celebrations and holidays that give them another excuse to take time off work and party. So the odds that you will find something going on while you are here is good. Teotitlan de Valle where they make genuine Zapotecan rugs famed for their natural dyes and hand made quality. San Bartolo Coyotepec where they make the famed black pottery from a clay found only in this area . . . They add fuel to the fire and close the doors to infuse the pottery with carbon from smoke and burnished the pottery with a quartz stone which gives it a metal sheen. Are there any ruins to see? You bet! The Oaxaca valley has been inhabited for thousands of years. The ruins at San Jose Mogote (now just a collection of mounds), just a few kilometers north of Oaxaca Mexico dates back over 3 thousand years. The height of civilization in Oaxaca can be seen at the ruins of Monte Alban which are on a mountain overlooking Oaxaca City. Monte Alban seems to have been the dominant city in the area from around 450 BC to 700 AD. By 800 AD, the city of Monte Alban was abandoned while the cities of Mitla and Yagul continued to grow and prosper (at least until the arrival or conquest of the Spaniards). And don't even get me started on the food, local raw chocolate or coffee. Oaxaca is famous for its cuisine as well.